Having since studied at private language schools in Argentina, Spain, and Bolivia, I now have a much better idea of which is best and why. I therefore wanted to give my advice as a result of my personal experiences in both areas. This way if you want to learn Spanish and are facing a similar predicament as I was, you should have a better idea of which is best for you after reading this article. Studying somewhere that has a clear local accent can certainly help you as a beginner learning Spanish. Equally, as you advance you may want to head into towns or cities where there is a thicker/quicker local accent. In the case of the latter it will help you to improve your overall listening skills as you progress. Below are some factors you should consider when it comes to accents and pronunciations in both. – Argentina has quite a few different pronunciations compared to most other Spanish speaking countries. They also use the word ‘vos’ instead of ‘tu’ (the word for ‘you’ in English). This in turn makes some of the typical verb changes in Argentinian Spanish somewhat different to most of the rest of the Spanish speaking world. – The Spanish spoken in Chile is fast! If you can understand a Chilean you can probably understand anyone! – The Spanish spoken in places like Madrid and Salamanca is usually very clear. I have also found Catalonian Spanish is also ironically one of the easiest to understand, despite the fact that many Catalonians would list Catalan as their first language over Spanish. – In many parts of South America, e.g. Bolivia, Peru, Ecuador etc, you will find many communities who either speak only their indigenous language, or speak Spanish as a second language (with their indigenous language coming first.) For example, in Bolivia it tended to be that the language of the cities (and business) was Spanish, but the language of the pueblos was Quechua. 2. South Americans do not use the word ‘vosotros’, the plural of the word ‘you’ in English. This means there is an entire set of verb changes that you do not need to learn if you study here – which makes things a little bit easier for beginners. However, if you plan on using your Spanish in Spain at any point you will still need to learn this! 3. South American Spanish is easier to pronounce from a native English speakers point of view. Even in Spain, I usually stick to South American pronunciations, e.g. using the sound of ‘c’ instead of ‘th’, and also using a lot of South American words instead. Both can usually be understood in either, but for me I’ve found people have complimented much more on my Spanish since I picked one and stuck to it! Regardless of any of the points listed above, it’s important that you get used to the accents and pronunciations of whichever Spanish-speaking country you are likely to spend most time in, as at the end of the day you need to be able to understand people! If you’re based in Europe this is going to be the hardest factor to weigh up when deciding where you want to study. If you’re based in the USA, South America (or indeed further north in Mexico) is probably better for you because of the reduced flight costs. For Europeans it relies entirely on how much time you have to study, as a flight to South America is naturally going to cost more because it is so much further away than Spain. You need to offset that flight cost against the cost of the school and your living costs. Overall what I would say though is don’t sacrifice quality teaching and resources over money. Make sure you get a good school. You will learn so much more and so much more quickly! Secondly, if you also want to have a really good travel experience at the same time, you may still want to pay more for the ability and experience of learning in a particular destination. If it’s just about the cheapest language classes though, I haven’t found anywhere cheaper than Bolivia! You’ll find quality schools in both Spain and South America as well as a fair share of not-so-good-ones too. The key to look out for is a school that follows the Common European Framework. This is the same for both Spain and South American language schools. For example, I followed this framework in Argentina and Spain when I studied. It made it easier to indicate to my new school what level I was at when I continued my studies further on in my travels, but the framework is also a tried and tested structure for intensive Spanish-language learning. Most people will learn quicker in these schools than in ones which don’t follow a structured framework. Truth be told, if you have the time I recommend doing a bit of both. 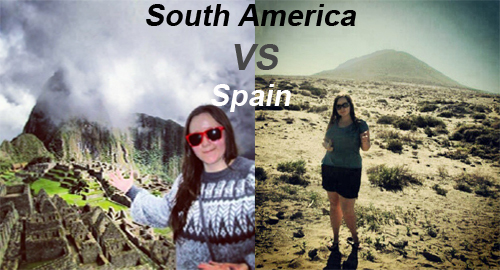 For example, if you’re planning a big trip to South America you could pick a school or two to go to there, and maybe a year or so later when you’re on holiday in Spain, you could continue those studies? It would certainly help if you wanted to be able to understand a large variety of Spanish-speaking accents, because depending on where you are in the world they can be very different! Great list and tips! This is actually something I am considering doing next year! I don’t know about anywhere else in the world but I found learning Spanish in Central America very easy. Seeing how I will likely be in Latin America for the better part of a year, this is definitely on my radar. Thanks for the info! Hi Jane, great points for sure. Monika & I are in Colombia right now and have started taking Spanish lessons with another couple. We have got a very good price and our teacher comes to us!! I’m not sure how it would compare with learning in Spain, but I know when I learnt my German and Swiss German it was best learning in the country as a-posed to trying to learn from home, which was UK back then. We are currently in Medellin which is awesome by the way.